The Atlantic League of Professional Baseball (ALPB), the most innovative league in baseball, today announced its awards for regular season accomplishments during its 18th season including the league’s Player of the Year, Pitcher of the Year, Manager of the Year and league-wide end-of-season All-Star lineup. The results were based on votes from club managers and executives. Bridgeport Bluefish OF Welington Dotel, who led the league in hits (180), triples (13), extra base hits (52), total bases (261), stolen bases (45), and slugging percentage (.492), was named Player of the Year in a unanimous vote. He finished in second place for the batting title (.340) and now holds the club’s single season record for hits and triples. Dotel, 30, was named to the 2015 ALPB All-Star team earlier this season and won the Home Run Derby. 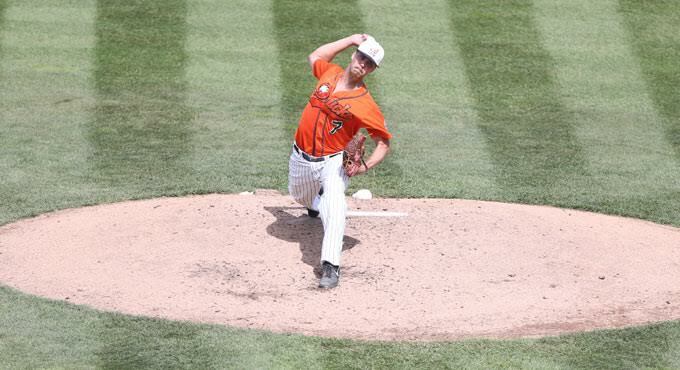 The Long Island Ducks ace of the pitching staff this season, John Brownell (RHP) was named Pitcher of the Year. Brownell finished in a two-way tie for the most wins this season (12) while striking out a league-high 146 batters this season, with a 3.38 ERA (5th best) and a 1.13 WHIP. The Ducks were 18-8 in games which Brownell started. Prior to this season, he was voted by the fans as the right-handed starting pitcher on the club’s 15th anniversary honorary team. "We're proud of John and the fact that he is being recognized for his outstanding season," said Ducks President and GM Michael Pfaff. "He has worked hard to make a positive impact and is not only a great pitcher, but also a strong leader and good teammate." In his third season coaching the Somerset Patriots, Brett Jodie led the club to their sixth all-time championship and first since 2009 while being named Manager of the Year. The Patriots won the first-half and second-half Liberty Division titles for the second consecutive season. He led the club to a league record 50 wins in the first half. Jodie, 38, who holds a career 264-154 record (.632) became the fastest manager in Atlantic League history to reach 250 all-time wins this season. "As a manager, you're only as good as the players and coaching staff that you work with and I've been very fortunate to be surrounded by great people in the clubhouse, but also the organization itself, led by Steve Kalafer and Patrick McVerry,” said Jodie. “I'm proud that this team was able to take the championship back home to Somerset and look forward to hopefully doing it all again in 2016." "Brett is as deserving of this award as anybody ever can be. He is a consummate professional on and off the field and truly represents the Patriots Way,” said McVerry, GM of the Somerset Patriots. “I've heard players come through here that have played at all levels of professional baseball say that Brett is the best they've ever played for. That says a lot about the type of manager and person that he is. We are all very proud of Brett and the tremendous season he guided us through." The Atlantic League has named the 2015 End-of-Season All-Star team featuring the league’s best players, according to the ballots of league executives and managers. The Atlantic League is the most innovative league in professional baseball, offers the highest level of minor league baseball playing skills, and is a player gateway to Major League Baseball. Its mission is to bring a high level of professional baseball and affordable family entertainment to select communities not presently being served by Major League or Minor League teams. ALPB players are highly experienced professionals, having progressed through professional baseball’s developmental levels (A, AA, AAA). Over 40% of all Atlantic League players have Major League service time. Like MLB, Atlantic League clubs pay their players to win baseball games, not to apprentice as in baseball’s developmental levels. The following teams play in the Atlantic League: Bridgeport Bluefish, Camden Riversharks, Lancaster Barnstormers, Long Island Ducks, Somerset Patriots, Southern Maryland Blue Crabs, Sugar Land Skeeters, and York Revolution.